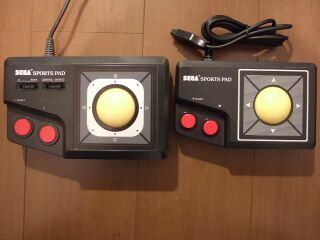 The Sega Sports Pad (セガ スポーツパッド) is a Sega Master System controller designed for sports games. The controller exchanges the standard Master System D-pad for a trackball for 360 degree motion (though the controller can be set to use the standard 8-directional movement setting for other games). There are two versions of the Sports Pad - a larger North American version with the extra switches to allow it to be used with non-sports games, and a smaller Japanese variant that lacks this feature. Due to a lack of game support, the controller didn't catch on. Main article: Sports Pad/Magazine articles.